Diving is a serious endeavor and demands a serious watch. The new Insignum Subwave Dive Watch might fit the bill for divers and other adventurers. Dive watches have always represented adventure to me. Real dive watches are built to take pressure and they have a rotating bezel to help a diver keep track of his remaining air supply. These watches are the watches of real and fictional heroes like Jacques Cousteau and James Bond. Divers are functional manly, action-oriented, watches. That's why I was excited to receive the new Insignum Subwave Dive Watch in Black, Red, and Steel. Just looking at the timepiece evokes images of exotic locales and underwater adventures. When you put it on, you feel ready for any adventure. Style. Form follows function on a dive watch and this Insignum is no exception. Each watch in the Insignum Subwave series has the look, feel, and functionality of a classic diver with a large contemporary dial and case size. It has the uni-directional rotating bezel and a magnifier (called a cyclops) over the date window. The bezel follows traditional dive watch conventions with tick marks for the first 15 minutes, then a red sector for the next 30 minutes, and is black for the last 15 minutes of the hour. My aging eyes appreciate the assistance of the 2x magnification, but it is only helpful when you look at the date window directly from above. At night, luminous hands and luminous dot and stick markers make it easy to read the watch in low light conditions. The red and black bezel rotates with satisfying clicks. 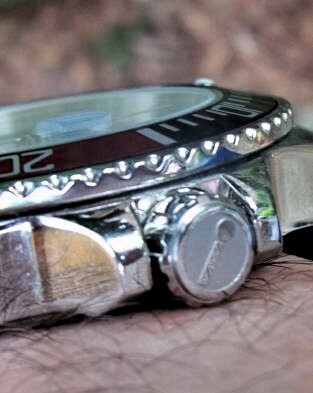 The watch looks and feels like quality with details like a small "i" on the crown and an etched caseback. Size. I was a little concerned about the size of the Insignum Subwave, but I'm a big guy and I found the watch well proportioned and comfortable. The watch is a generous 48 millimeters in diameter and a hearty 13.5 millimeters thick. It is a bit heavier than the thinner watches that I normally wear. However, the edges of the watch are smooth and the band doesn't dig into my wrist or forearm anywhere. The Subwave is substantial watch, but comfortable and not overly heavy or overly thick. Under the sea, the large size should make the watch easy to read in all conditions and the bezel can be manipulated with gloved hands. On land, the watch fits under the cuff of a long-sleeved shirt and looks great at the office. Construction. The insignum Subwave is built to look and be tough. 316L stainless steel is used for the case and the broad 26 millimeter wide bracelet. The push-button dual deployant clasp has a safety latch to keep the watch solidly on your wrist. The watch has a tough sapphire-coated glass crystal. Thanks to a screw-down crown, tight manufacturing tolerances, high quality materials, and strict quality control, the Insignum Subwave is water resistant up to 200 meters. This degree of water resistance allows the watch to be worn for recreational swimming, scuba diving, and snorkeling. Ultimately, I found the Insignum Subwave Dive watch to be an impressive watch that doesn't have to stay in your shoes at the beach. It is suitable for all sorts of aquatic and terrestrial adventures. Note: My friends over at ZuluTimeZone provided me with this Insignum Subwave watch.